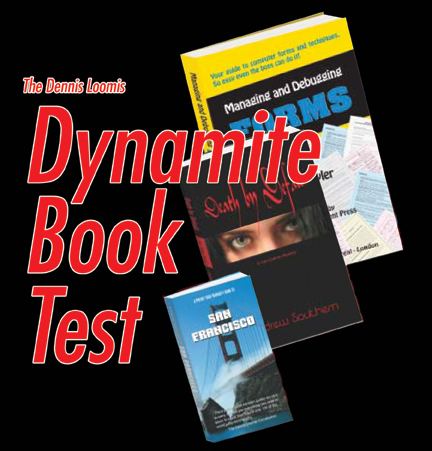 Discount Magic - Dynamite Book Test. A spectator is freely chosen, not a prearranged confederate or stooge. You walk to the other side of the stage and turn your back or are legitimately blindfolded. No peeking. The spectator is given an absolutely free choice of one of three paperback books. The spectator picks up any book, thinks of any page number, does not tell anyone the page number, writes nothing down, no force, and the spectator can change his mind as often as he wishes. The spectator opens the book to that page number and thinks of the first word on the page. With no pumping, nothing written, no letter by letter spelling, you name the word. The spectator thinks of any other page number, tells no one the page number, he can change his mind as often as he wishes, and turns to that page. The spectator looks at the last word on the page. You tell him the word he is looking at. The climax is beyond belief. The spectator thinks of any other page number, changes his or her mind as often as he or she wishes, tells no one, turns to that page, and is instructed to look at ANY OTHER WORD on the page. You do not know the page number. You read his mind and reveal the word he is staring at. No prearranged stooges or confederates. No peeks. No mirrors. No reflectors. No force of the book. Nothing written. Absolutely free choice of book and page number at every stage. No assistants. No electronics. No pumping. No progressive anagrams. No cribs. This is the streamlined version which uses only one book. You do the first two phases as above. For the third phase, there is a prediction in an envelope that has been in full view since you started. You never go near the prediction. Any spectator opens the envelope. You never touch it. The spectator thinking of any other word on any page announces the word. The other spectator opens your prediction. In big bold letters, on a letter size sheet of paper, is the word the spectator is thinking of. Comes with ten pages of very detailed and thorough instructions. Note: This is the Guide Book only - the three book set is also available (select below). Dynamite Book Test Read every word carefully. Nothing has been left out. If the description fools you, you will be devastated by the effect.